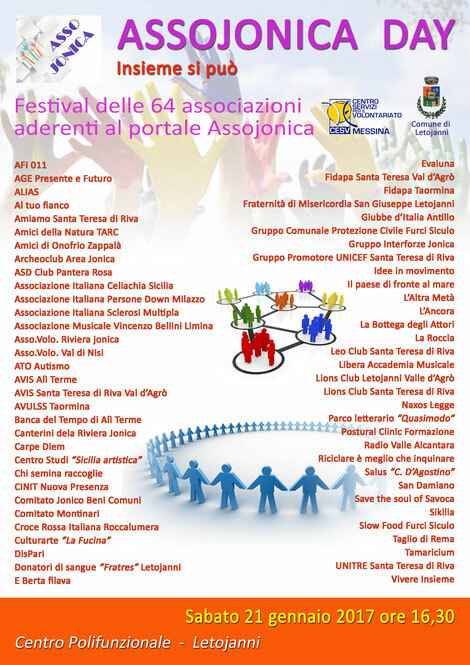 ASSOJONICA DAY - Insieme si può: la festa delle associazioni aderenti al portale Assojonica - Benvenuti su portaleassojonica! Wow, wonderful weblog structure! How lengthy have you been running a blog for? you made running a blog look easy. The whole look of your web site is magnificent, let alone the content! Just desire to say your article is as astonishing. The clearness in your post is just cool and i could assume you're an expert on this subject. Well with your permission let me to grab your RSS feed to keep updated with forthcoming post. Thanks a million and please keep up the rewarding work. Having read this I believed it was rather enlightening. I appreciate you taking the time and effort to put this information together. I once again find myself personally spending a lot of time both reading and posting comments. But so what, it was still worthwhile! Have you ever considered creating an ebook or guest authoring on other sites? I have a blog based on the same topics you discuss and would really like to have you share some stories/information. I know my readers would value your work. If you are even remotely interested, feel free to send me an email. I am now not sure where you are getting your information, but great topic. I must spend a while finding out much more or figuring out more. Thank you for excellent info I used to be on the lookout for this information for my mission. Howdy! Quick question that's completely off topic. Do you know how to make your site mobile friendly? My site looks weird when viewing from my iphone 4. I'm trying to find a theme or plugin that might be able to correct this problem. If you have any recommendations, please share. Many thanks! Marvelous, what a webpage it is! This blog gives useful information to us, keep it up. We absolutely love your blog and find a lot of your post's to be exactly I'm looking for. Do you offer guest writers to write content for you? I wouldn't mind composing a post or elaborating on a lot of the subjects you write in relation to here. Again, awesome site! Appreciating the commitment you put into your website and detailed information you present. It's good to come across a blog every once in a while that isn't the same old rehashed information. Great read! I've bookmarked your site and I'm adding your RSS feeds to my Google account. Hey there, You've done an incredible job. I will certainly digg it and personally suggest to my friends. I'm sure they'll be benefited from this web site. Hello there! This post could not be written any better! Reading this post reminds me of my previous room mate! He always kept chatting about this. I will forward this page to him. Pretty sure he will have a good read. Thanks for sharing! Please let me know if you're looking for a article author for your blog. You have some really good articles and I think I would be a good asset. If you ever want to take some of the load off, I'd love to write some material for your blog in exchange for a link back to mine. Please send me an email if interested. Thank you! Vuoi essere il primo su google e su tutti i motori di ricerca?